So, my mom moved into her new Townhouse last month, taking 26 years of “stuff” and moving it into an adorable new (smaller) casa. I’ve been working with her to get the new place decorated the way she wants it. As we all know and like to forget, it takes way more time than you think to get things situated! The kitchen and downstairs powder room were gut jobs. The entire Townhouse was painted top to bottom and we replaced every door in the place. New light fixtures throughout with dimmers – any new furniture or recovering would have to come later. I always think it is a good idea to live in a place for a while before you begin the solid decorating with new fabrics, furniture, wallpaper so you have a better idea what your real needs are and how you want everything to look. Here is the new powder room. The only think we kept in here was the tile floor and a fairly new Kohler toilet. New vanity, light fixtures, mirror, wallpaper and fresh paint. It was fun to rip out the old stuff! There is a cute shower in here for guests, but it is primarily used as the downstairs powder room. I kept the shower curtain simple with a white matelasse from Pottery Barn. New light and fan in the shower too. This was a pretty quick and easy project. I have two more bathrooms to tweak, but this is the one all of mom’s guests will see, so it was first on the list. Here is the old kitchen. Everything was ripped out and all new is going in. We are keeping the exact same kitchen footprint to keep construction costs down. The goal was clean, modern and fresh. View into the new kitchen. Nice glass pendant lights highlight the contrasting blue counter. We need to find 2 or 3 cute bar stools to pull up to this counter! View out of the kitchen into the little den/TV area – TV wires ready on the right wall for the flat screen install. The white corian countertop and white subway tile keep the look nice and fresh! Every door in the townhouse had to be replaced and you can see why! We installed simple shaker 2-panel doors and used matte black hinges and doorknobs on all of them. Trim and doors painted white. This week, I had my fabulous ‘hangman’ come to my mom’s to help us hang her artwork. If you need someone to help you hang anything, I highly recommend Matthew O’Keefe. New chandelier over the dining area. Very high ceilings in this room. Ignore the clutter on the two tables! We are still trying to find places to put everything. Big painting on the back wall up. I need to find some fun and modern sconces for either side of this painting. Suggestions welcome! 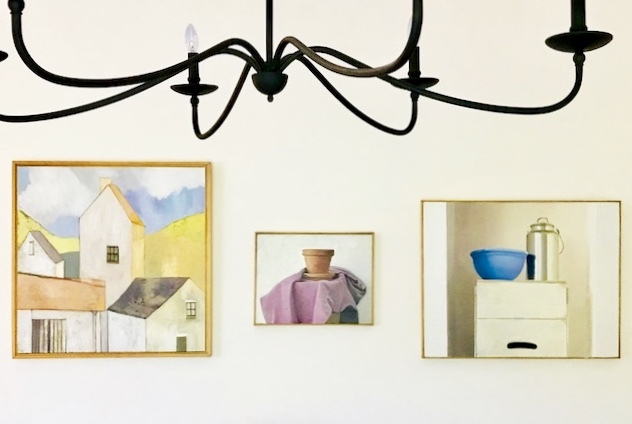 On the wall to the left of the dining room, Matthew hung up a modern triptych of paintings. Two more paintings in the kitchen. While we were hanging all of these pieces, a RAGING series of thunderstorms was rolling through, complete with hail (photo on right) and tornado warnings. We had to stop and watch the giant bolts of lightning and black sky – NUTS! There is still more to do at my mom’s. We head to the D&D Building in NYC on Monday to start pulling fabrics and looking at some key furniture pieces to replace some older stuff. My spring candle is out and smells divine. If you love hyacinths, this one is for you! Wow Liz – great job with your mom’s place. Simple changes with big impact. So impressed!